Do you feel easily overwhelmed? Feel drained after seeing clients? Feel extra sensitive in the lead up to or during your menstrual cycle? And even decide not to do certain activities or accept invitations as you know this will knock you off balance? Many of us feel easily overwhelmed by the pace of life, drained by going into places where there are many people or discordant energies such as hospitals, shopping centres and workplaces. Even over use of mobiles and computers can contribute to just being plain exhausted by the end of the day. The good news is that flower essences can really help to create and maintain instant well-being for you as you go about your day. 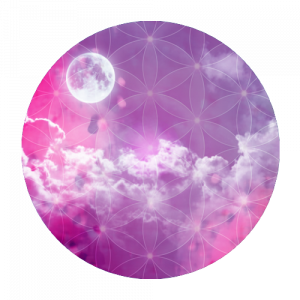 So in this article I am going to show you a really easy way to make a flower essence mister and use it in your energy field to create an instant sense of well-being for you (and your clients if you are a practitioner). Taking flower essences internally is the most common way of using them and this is a way I recommend and use regularly. However, using essences externally for many people gets faster results – giving reassurance when you feel anxious, upliftment when depressed or feeling stuck and in this case – helping to nurture feelings of safety and even energy flow as you go about your daily life. 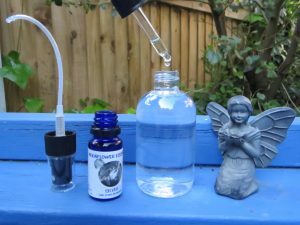 Using essences in misters is really helpful as you can use them with people of all ages – including children and the elderly – and people who are unwell. Essential oils can also be added for a more physical effect….although for discreet use (such as when travelling or at work, using them on their own is great as no one knows what you are doing)! So here are some ideas for making a mister to use to help you stay feeling safe, centered and grounded as you go about your day. It is very easy to create – add a couple of pipettes of your essence into the mister, top up with water, add a label to your bottle and you are ready to go. Mist it in your energy space before going out, at any time you feel tired or unsettled and when you come home. Use it before sleep to wind down and clear old energies from your space. Keep it in your handbag and use when you feel you need calming or grounding OR keep it in your car to keep you centered when out and about. 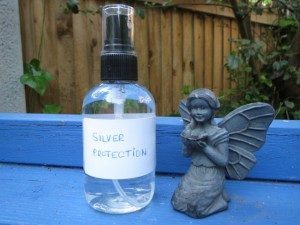 MoonFlower Silver Essence – this Silver Essence (made in moonlight) offers flexible and fluid protection in a soft, feminine way by reflecting back all that is not in alignment with your way forward. Silver Essence also cools, calms and soothes a fraught energy system. Australian Bush Essence Fringed Violet – is a delicate flower that clears and protects the subtle energy system, repairing an aura that has been damaged by shock or trauma. Alaskan Protection and Guardian Combinations – two of my favourite combinations. Use Protection if the focus in on clearing energy and Guardian if the focus is on feeling safe. These essences can be used separately or in a combination that feels right to you. Writing a personalised label for your mister adds a personal touch and also encodes your own specific intention into the water. The same mister (see photos above) can carry slightly different intentions depending on how you are feeling! 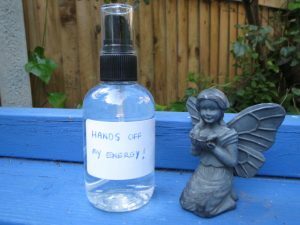 You can see how easy it is to use essences to help you get on with life and feel less bothered by challenging environments or people. Why don’t you try it for yourself and also make up misters to pass on to your friends.